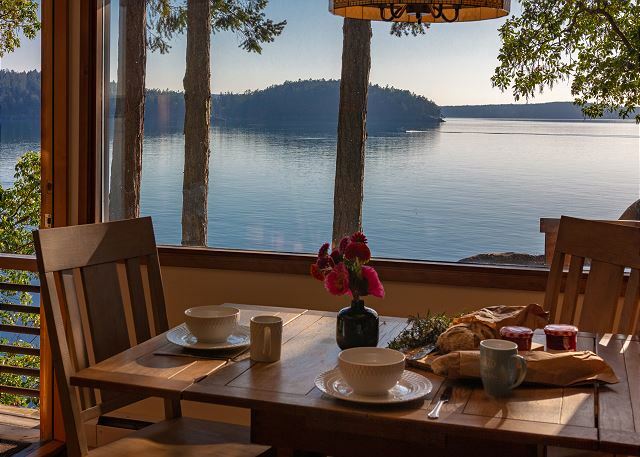 WESTSIDE ORCAS ISLAND WATERFRONT HOME WITH A GREAT VIEW AND POCKET BEACH Located past Deer Harbor, on the west side of the island facing Sidney, British Columbia in the distance, you'll find this wonderful vacation rental home. Imagine sun sparkling on the waters just outside the windows, amazing sunsets, views of neighboring islands, both near and far, the activity of boats and ships heading north and south, the call of seabirds, sightings of seals or possibly even a passing Orca…that’s the atmosphere you’ll enjoy when you stay at Sunset Cove This home has a true Island feel – it’s not pretentious, just tasteful, comfortable, and cozy. 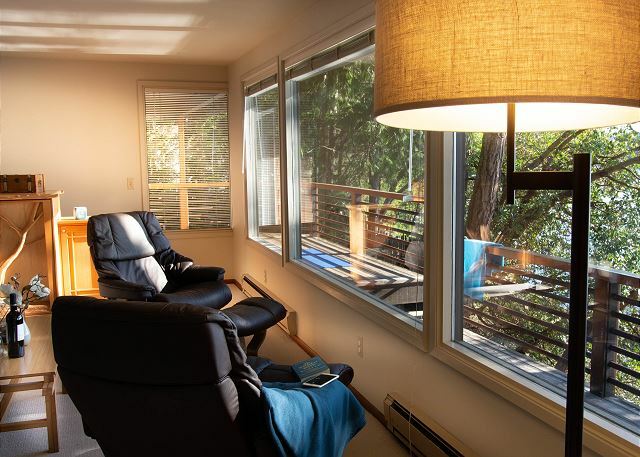 The kitchen and bathrooms have been attractively upgraded, and there’s a large deck where you can dine and unwind listening to the soothing sounds of the waves. On the main level, there's a well-stocked kitchen with Viking cooktop, Sub-Zero fridge, and an oven with convection cooking. 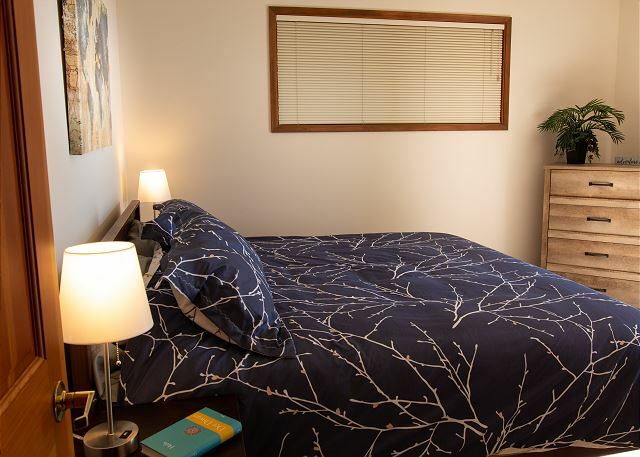 Also on this main level are the master bedroom with a lovely king bed and a second bedroom with a full bed and single trundle below. The two main level bedrooms share a large bathroom with dual vanities. 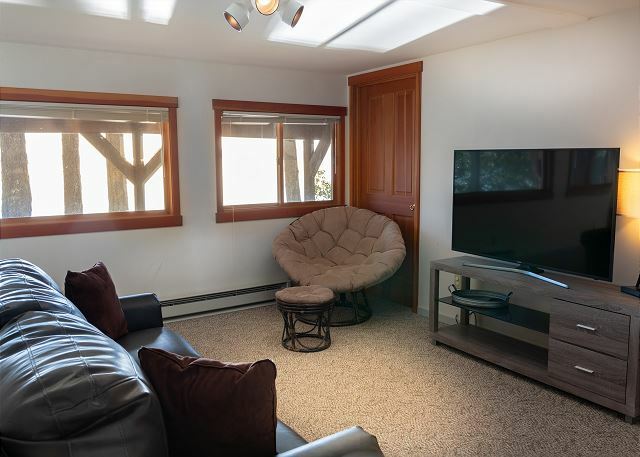 Down a flight of stairs off the living room is a second bathroom and another bedroom with a queen memory foam mattress sleeper sofa and the laundry room which has an extra fold-up twin trundle bed. In this lower area there’s also a desk, and large screen TV with DVD, and the laundry. With a private entrance, this lower area can become a second master suite or provide a private retreat for a teenager. The beautiful pocket beach just below the home is accessed with a steep ladder-type stairway built into the bank. As there is a significant drop from the top of the bank to the beach below, recommend children are supervised if outside. Some friends and I wanted a bit of a getaway. We had a lovely time relaxing, enjoying beautiful views, and watching sealife from the windows! We had a great couple night get away in this beautiful home with a knock out view! We had a fantastic few days at Sunset Cove. The house is very comfortable for five people and well equipped. We carried our kayak down the steep staircase to the private beach and went exploring over to Jones Island, and were followed by seals and saw porpoises. The February weather was fairly cold, with snow here and there and blocking the road to Mt Constitution but we had rain only 1 day out of 5, and at times the sun made it feel quite warm. We recommend the hikes to Ship Rock and Turtle Head for the beautiful views. In the house, the downstairs room was a good den for the kids. It was nice to have Netflix. The beds were comfortable and the bathrooms spacious and clean. The reservations team communicated well and warned us about possible snow which was nice. Overall a great week and welcome change of pace. We enjoyed our short visit. The house had everything we needed. The Island is beautiful. Only one thing stood out in our minds as needing attention. The white rug is lovely but it was raining and muddy outside and we did everything we could to not leave any tracked mud into the house; we always wipe Sophie's feet before she comes in. Still....hmmm. Anyway it was a beautiful location, the view and the Sea Otters - !!! loved it. This home was wonderful for our vacation. 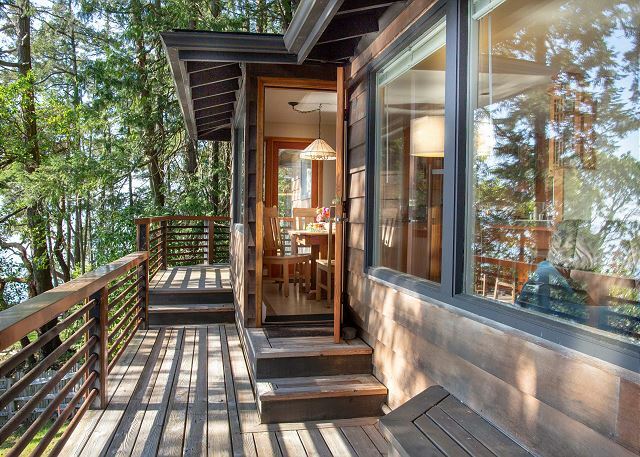 We had our boat at Deer Harbor, and this home was very convenient for going back and forth. The view was stunning. Kitchen was well equipped. Living area was comfortable. The home was clean and had everything we needed. Would rent this again! 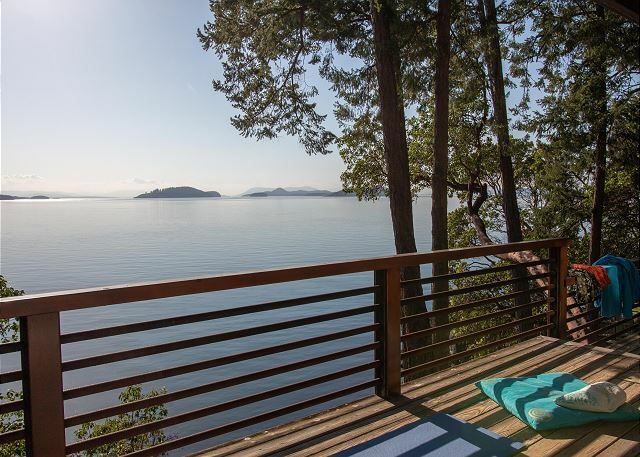 This rental is ideal for those who want an idyllic Island retreat. The expansive ocean views are truly breathtaking, get ready to see an impressive assortment of sea animals and stunning sunsets. 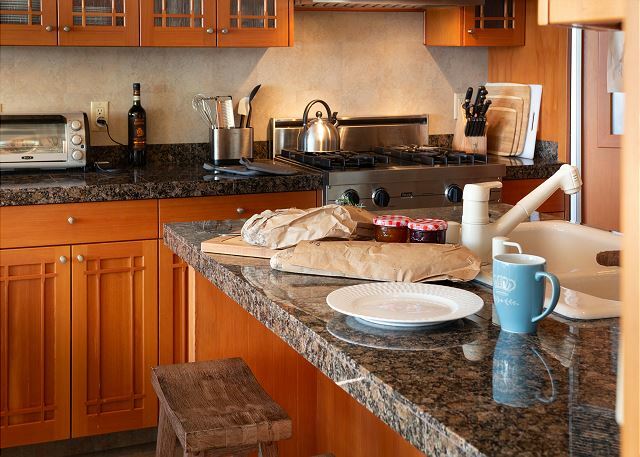 The gourmet kitchen is well stocked and a dream to use, there is also a barbecue on the deck if you feel like grilling with a stunning backdrop. The basement is ideal for older kids and they absolutely loved the smart tv and PlayStation. This is an inviting, spacious, perfectly stocked with great attention to detail, nicely maintained rental. Highly recommended! Would book again in a heartbeat. 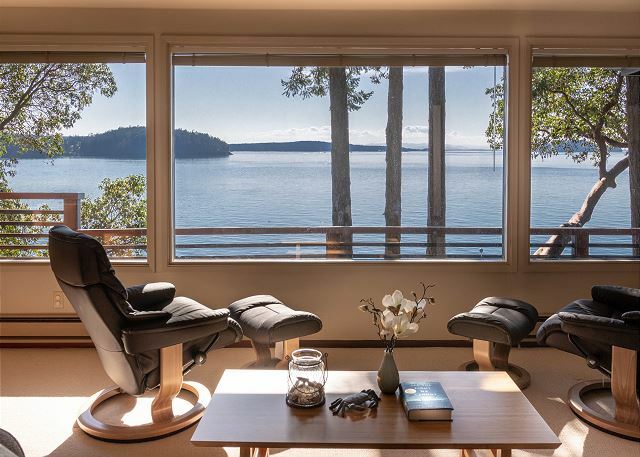 This home had great views of the water and many other islands. The westerly view provided amazing sunset views every night. The location is very private and remote, which we loved. 10-15 minutes to the ferry terminal and about 20 minutes to Eastsound. The beach access was by a steep ladder and was fun climbing down to the rock beach. Otters and sea lions visited every day. We had 5 people and we were very comfortable. Plenty of room. The place felt very new and was clean. Great hiking nearby at Turtleback Mountain. We can’t wait to go back and stay at the same location.